A new Khukuri by Khukuri House on which the handle is made out of Water buffalo Bone which is also known as Hadde in Nepali hence the name. Good one for lighter use but a Perfect one as a show piece. 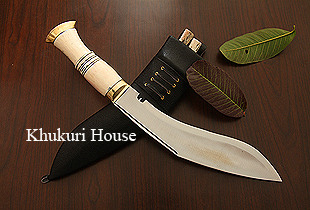 A new Khukuri blade by Khukuri House on which the handle is made out of Water buffalo Bone which is also known as Hadde in Nepali hence the name. Good one for lighter use but a Perfect one as a show piece. The Khukuri is very similar to all the standard sizes Khukuri this house has produced so needs no explaining. Just a new handle so a new Look.